Today’s post is written by Holy Hen House sponsor Rachel Braun of Branches Band. What is one frequently asked question musicians have to deal with? Of course, I’m sure we as musicians are not the only people to get asked that question. That list could include stay-at-home moms (or dads), people who work from home, artists, writers, etc. For some, being asked this question might sting a little. “Of course I have a real job; can’t you see all of the work I’m doing? !” After we (Branches Band) finish up a concert or worship service - singing and playing our hearts out - we come back to our table to chat with people and answer questions... and ‘this question’ comes up fairly often. We just smile and say “this IS what we do for a living!” and then receive any variety of (somewhat shocked) responses. Which begs the question; what is a REAL job? Let’s start with what we DO first. Anyone out there can make their own list of things they do; whether it’s dishes, laundry, and preparing meals; or spreadsheets, phone calls, and meetings... we all have a list. Through the ministry of Branches Band we are blessed to be able to do so many different things that, especially starting out, we didn’t even consider to be possibilities. We are able to play music for a living! We get to travel all over the country (we have played at over 400 churches and in all 50 states and Canada!). We create resources for individuals, choirs, and congregations to use. We have produced nine albums, seven songbooks, individual sheet music, t-shirts, egg-shakers, guitar picks, tote bags, etc... it is sometimes overwhelming to think about the ways that God has blessed us to be able to do all of these things. But, if we get down to it, that’s really only a list of what we do; it’s not our real job. In our travels, and with our recent children’s CD of all original songs, we have found ourselves doing a lot of programs for preschools, grade schools, and other various church youth outreach programs. Aside from teaching songs about our Savior, we talk to them about our ministry, and one point that we try to emphasize to these children is this: our job allows us the opportunity to use our gifts to serve our Savior, and you should do that too! if it is to encourage, then give encouragement; if it is giving, then give generously; if it is to lead, do it diligently; if it is to show mercy, do it cheerfully. That certainly is a ‘real job’. Take what you DO (whether that’s preparing meals, leading or participating in meetings, or yes, even music), and use it for your real job: to serve the Lord with your gifts. We as Branches Band got into this ministry to share the good news that Jesus Christ came to this earth, lived a perfect life in our place, died undeservedly on a cross, and rose again; all of this to save each and every one of us from our sins and from certain damnation. We get to share that good news in every worship service and concert we give. We also want to give other people the opportunity to share that same message through what we do. That’s why we create CDs: so you can listen to them yourself and be encouraged by God’s love, and also so you can share them with a friend going through a rough time, or family member suffering in the hospital, or a co-worker that wants to know more about what you believe. That’s why we create songbooks and sheet music: so those people with musical talents can put them to use in playing and singing God’s praises in their own churches. That’s why we create extra items like t-shirts and tote bags displaying our ‘theme passage’ (John 15:5; “I am the vine; you are the branches.”): so whenever you wear or use one of these items you have the opportunity to start up a conversation about who the Great Vine is in your life. We want people to be able to use these tools for sharing the good news about their Savior. Visit our website and make use of these resources! We all, as Christians, have a real job. No matter what your skill set is or where you are in life, we all are called to spread the Gospel and serve our God in accordance with the gifts given to us! How do you use your gifts in your real job? Branches Band, a Milwaukee-based music group, travels all over the country using their love for music to identify the Savior of the world: Jesus! From ancient hymns to modern songs, from guitars and piano to percussion and vocal harmonies, the truth of God’s love and grace is at the root of the Branches Band ministry. For more information, visit the website www.branchesband.com, or find them on Facebook at www.facebook.com/branchesband. When I was in seventh grade, I decided I was going to be a professional musician. Of course at that age, all I wanted to do was play in a major symphony orchestra. I had just started playing in a youth symphony program and, even at twelve years old, could barely imagine doing anything else with my life. 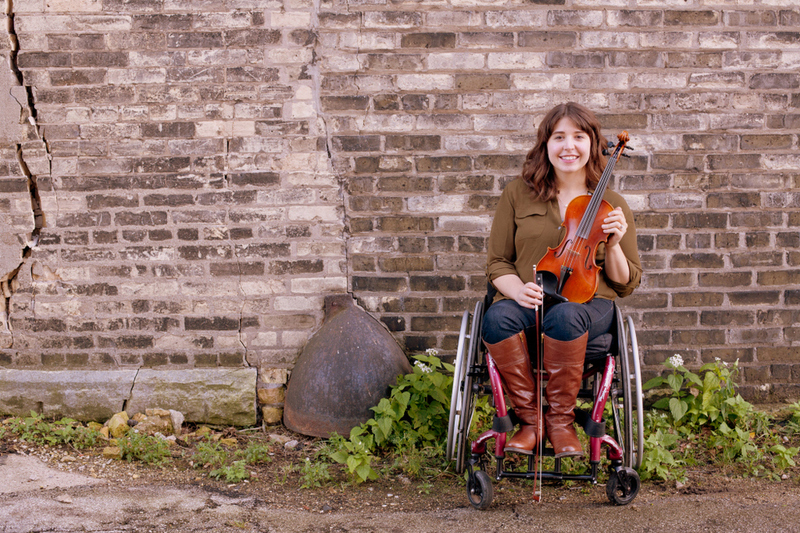 Over time, my dreams became a little bit more realistic and six years later, I started studying music therapy at the University of Minnesota. When I first arrived, I was thrilled. I had been fighting for independence as long as I could remember. You see, I've been in a wheelchair since I was four years old. I was born with a rare spinal cord injury. For the most part, I have been extremely blessed and have been able to do most things independently. Sure, I couldn't play kickball the same way all the other kids did at recess in grade school, but we had our own modified version. I also played wheelchair basketball and of course, my main thing was playing violin. However, as a teenager, I began to crave more independence. I just wanted to live on my own in a new city. So there I was in Minneapolis. But college was not all I expected. The classes were hard and when faced with health issues during my first semester, I was alone. I kept at it, studying music therapy for the entire time I was there. I made lots of great friends and enjoyed my time, but during that time I started doubting whether or not being a music therapist was actually the job for me. Sometime during my time there, I decided it wasn't. I moved home to Milwaukee, got married, and started the only other thing I could imagine doing with my life. I still wanted music to be my main focus, so rather than using it as a tool to heal people, I decided I just wanted to share my love of it with others. I wanted to do what my first violin teacher and parents did for me. That's what I do today. I teach Suzuki violin because I truly believe it is the best method out there, especially for teaching little ones. My favorite thing about it is the focus on the child as a person above and beyond being a violinist. I have an almost two-year-old son whom we take to a Suzuki Early Childhood class on Saturdays and I know he'll take Suzuki lessons in just a few short years, no matter what he picks as his instrument. It wasn't what I imagined for my life before college. But God clearly had other plans for me. Things didn't go perfectly for me in college, and things certainly aren't going perfectly now, but I can't imagine doing anything else. That's not to say God doesn't have different plans for me along the way. I realize that. But for now, I'm completely happy sharing my love of the violin with my students and watching them learn and grow while I keep learning and growing, too. Abigail Peterson teaches Suzuki violin in West Milwaukee. She started playing the violin as a "Suzuki kid" at 4 years old and somewhere along the way decided she was going to be a Suzuki teacher, too. She loves teaching students of all ages and spends a lot of time learning and growing to become a better teacher. When she's not teaching, she's playing with her young son, Otto, reading a great book, or watching Netflix with her husband, Kyle. If you are interested in Suzuki violin lessons or hiring a wedding/event violinist in the Milwaukee area, contact Abigail here.